Your role if a shooter or bomber gets in! Layer four of layered security (or layer one, if you have not taken my advice), is you the parishioner. You may be asking what can I do? There is a lot you can do. Next time you sit down for church service, look around and see what you may have that could be used as an improvised weapon. Think about this, you are someone that is planning evil in the church, you make entry into the sanctuary, only to be hit in the face with thrown hymnals and the Word of God (the Bible). How much damage do you think you are going to do if you are dodging the heavy books that keep hitting you in the face? 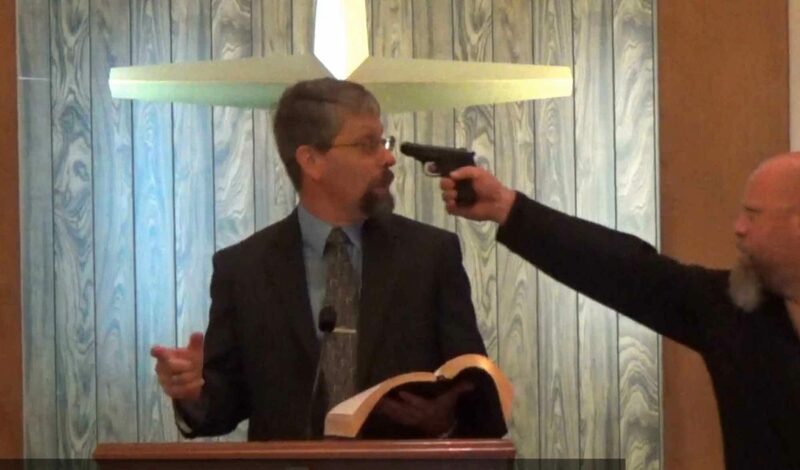 When I teach my seminars on Preventing and Surviving an Active Shooter in Houses of Worship at churches, I allow the attendees to see how effective throwing items can be. I give them a mix of bean bags and the plastic balls (the type used in kids fun centers), then ask for a volunteer to be our gunman. I give the volunteer safety glasses and a semiautomatic rubber band gun that shoots 20 rubber bands as quick as they can pull the trigger. In most instances, they are too busy trying to get away from the annoying things being thrown at them, than they are trying to shoot me with rubber bands. In fact, in most situations (not all), they only get one or two rubber bands coming my direction. The rest of their shots are way off to the side or they are not even shooting as they try to dodge the bean bags and balls coming at their face. You should fight the shooter ONLY as a last resort. If you have no other choice but to fight the shooter, fight as if your life depends on it, because it does/! Try to avoid hitting others as you fight the shooter. As the items are flying, one or two other parishioners should be rushing to tackle the individual, and take the gun away. Whenever taking a gun away from a shooter, or when trying to stop a shooter, you should try to avoid just pulling it from their hand. This might allow them to get shots off at people. Whenever possible, force the barrel of the gun towards the ceiling or floor, then pry it from their hand(s). Once again, this is a last resort. If the other layers of your security is working, then it should, in most instances, never come to this stage. On a side note, whomever is in the pulpit should be the early warning person. They will see the shooter or bomber before most people. They should announce “Gun, gun, gun!” as quick as possible.